When you’re drowsy during sitting meditation and nodding repeatedly, don’t continue or it’ll become a habit whenever you sit. It’s also a waste of time. When drowsy, try to make drowsiness the object; but if the drowsiness is too strong, then open your eyes and look into the distance, then meditate with your eyes open. If that doesn’t work, do standing or walking meditation. It is important that you ask yourself: Are you aware, are you aware? Constantly check the quality of awareness. One of my teachers told me that sleepiness and samadhi are brothers because if the mind is not stable, it cannot be sleepy. Because the mind is calm and stable, drowsiness can come and it is easy to sleep. So, every time I’m sleepy, I adjust a bit and then samadhi would be present. When there is drowsiness, you need effort and wisdom; if they are working and get stronger, then sleepiness will decrease. Sayadaw: You need to investigate about drowsiness from your experience. Ask these questions: What is the object, what is the knowing mind? Is there anything else? Is this the only object? What is the feeling? What is the knowing mind? What is awareness? What is the object? Yogi: In the late sitting, laziness arose in the mind and I just ignored it. Sayadaw: To know that laziness has arisen is good. But you should not ignore it, you should be aware that laziness is an object too. Any defilement must be used as an object. We’re not trying to ignore or neglect defilements; we’re trying to know everything – what is good, what is bad; everything that arises in the mind. We try to be aware to learn and understand. For example, when the mind is aware of an object, it may understand that the object is right or wrong, good or bad, or, cause or effect. That understanding we need; understanding is our aim – whether the object is good or bad is not important. We try to understand that the mind – good or bad – is impersonal/nature. When the mind becomes quiet and clear, sometimes the mind needs an image to explain its experience to itself. And so clarity is sometimes pictured as brightness. It’s a visualization of the clarity of the mind. So, the mind has created this concept to explain to itself. Do you notice that when there is sleepiness, it is dark? So the mind interprets dullness as darkness and clarity as brightness. Don’t look at the brightness. Once you understand that the brightness is a concept, then you know that it’s not an object to observe because objects are those things you can experience directly. The brightness will be there, but you just continue to be aware of what you can feel or sense directly because if you look at the brightness, you will not be looking at reality. It is just an image created by the mind. You want to get back to reality. The brightness will be there as the background; it doesn’t matter whether the brightness goes off or not. But you must know that this is the nature of the mind; this is what the mind does for some people when there is clarity. What is important is for you is to continue to know your physical and mental processes. Sayadaw: When you park your shoes, you were not mindful. Next time you take off your shoes, notice if you take off your right shoe first or your left shoe. Yogi: So, I have to put in more effort? 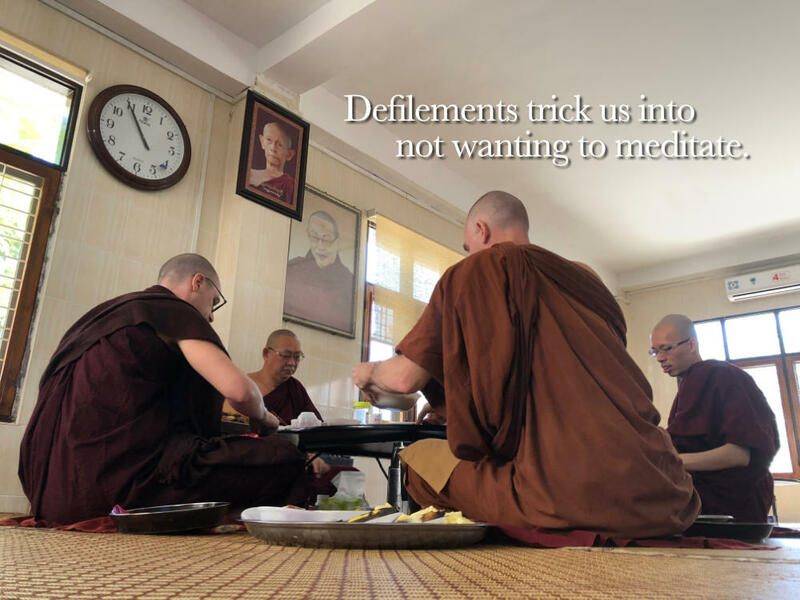 Sayadaw: Not more effort but be more careful, recognize and be more aware of what you are doing – just note; for example, note for yourself that it is here in this environment. That’s being mindful. When you were taking off your shoes, you were not with the activity of taking off your shoes; you were thinking of something else, so later you did not remember. All movements of your body, make it a habit to be with your body so that you note every movement. When you put on your clothes, know that you’re putting on your clothes. Whether you put on your right or left arm first or your head first. When you put on or take off your T-shirt, does your right or left arm or head go out first; how does it happen? Or you miss your body? You need to remind yourself to be aware as much as you can when you sit. During daily activities the mind is more active, awake and aware. When you sit, the mind has nothing to do – the mind is passive – so, it is easier for the mind to be lost at that time. You need to remind yourself – what is the mind doing; what is it aware of; how many objects can you know at one time. You ask some questions to wake up the mind. If you force too much to be aware, the mind also becomes tired. So, just think about the practice, the experience, or how the mind is meditating; just checking. Checking means reminding yourself how you feel, what the mind is aware of, how many objects do you know, which is the object and which is the awareness; just reminding yourself; and when the mind thinks about this, it wakes up. This thinking wakes up the awareness. You need to practice – whenever the mind is thinking, you notice. Try to be aware of the thinking again and again. And slowly the mind knows the meaning of object – thinking mind becomes object, and then you cannot be involved in the thinking. Thinking comes and goes, comes and goes, but awareness is already there. Awareness is present. But whenever you are involved in thinking, awareness disappears. We try to recognize thinking. If you are not skillful enough, recognize thinking and then go back to body sensations. Back and forth. Later when thinking arises, awareness arises too because the mind understands that thinking is an object. That’s why the mind is not involved in the thinking process. That’s why we need to recognize thinking often. Be aware of the thinking, be aware of the physical object, back and forth repeatedly. In the beginning we cannot know the thinking mind, we only know the thinking. Thinking is concept because thinking appears as images, sentences or sounds in the mind. But when we notice repeatedly whenever thinking happens, we also notice that beyond the thinking there is the nature of the mind. This is due to wisdom – it understands that beyond the concept, there is the nature of the mind – that it thinks. When we can see the separation between the object and the knowing mind – that this is object and this is mind it means that the mind has wisdom. If there is no understanding, the object and mind appear as one. You need to notice that the mind is thinking; be aware of that when it is happening and come back to the body sensation. You need to practice knowing that thinking is happening. Don’t pay attention to the storyline, the contents of the thought. The storyline is not important. It is enough to notice that the mind is thinking. If you pay attention to the storyline, then the mind is interested and wants to continue thinking. The mind doesn't wander anywhere. The nature of the mind is to arise and pass away. The mind never wanders away. If it can wander away, you’ll need to pull it back and the mind becomes permanent – this mind goes outside and this mind comes back. So the mind becomes permanent, right? What are we doing as we wander around throughout the day, sitting, standing, whatever? We are trying to know, being aware of whatever is happening in the body and the mind. "Wandering mind" just means that you are unconscious, not aware. You don't know that you are lost in thought. That's when there is wandering mind. But if you are thinking and you know there is thinking, that's not wandering mind, that's when you are aware there is thinking mind. Yogi: I have lots of wandering mind – so, I’m judging my practice negatively. Sayadaw: Our attitude towards the experience is very important. Know that thinking mind is nature and your responsibility is just to recognize that thinking mind is happening. Thinking is the mind. You cannot avoid thinking. We are not interested in the story line, the content of the thoughts; we try to know that thinking is the mind. So, when there is thinking mind, just recognize that thinking mind is happening. Thinking mind is not a problem; the problem is with liking and disliking.